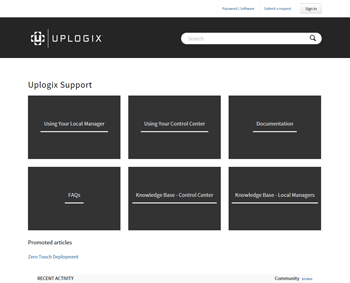 Uplogix customers have access to a variety of support resources, including self-help knowledge bases and documentation through the Uplogix Support site, phone and e-mail support for troubleshooting or configuration assistance, and onsite visits by support technicians. 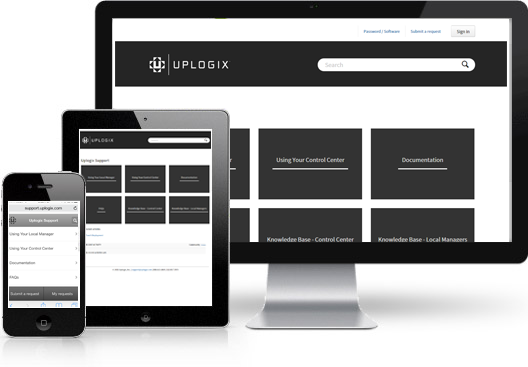 For customers with continuous and current maintenance subscriptions, Uplogix Local Managers (LMs) are covered by a lifetime hardware warranty. Any LM that fails will be repaired or replaced with a functionally equivalent new or refurbished LM at no charge through the Uplogix Support Return Material Authorization (RMA) process. Product Documentation | Includes user, installation, and reference guides as well as third-party documentation. Device-specific configuration guides and advanced-topic discussions are also available. Knowledge Base | A constantly updated repository of common issues/solutions, tips & tricks, configuration notes, and important software notes. Also included are product-extending custom rules and configuration examples. Software Updates | The most recent revisions of Uplogix Local Management software are available for download. Release notes are provided for each version of software. Support Cases | Customers can open support cases through a short form. Uplogix Support will be automatically notified of the new case. Deployment Planning | Assist in the integration and deployment of the Uplogix platform into the customer’s network. Device Management | If the included rules on Uplogix Local Manager don’t match the customer’s expectations, we can help create new rules. Onsite Repairs | In extreme cases, Uplogix will dispatch a technician to the customer’s site for hardware repair or replacement. US-based Uplogix Support Specialists are available via telephone and e-mail, 24 hours a day, 7 days a week.